7am - Later this morning, Little Honda will hook-up to Scampy. 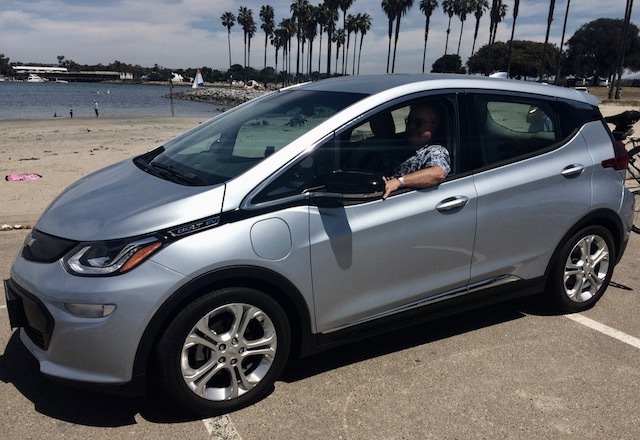 And, The Team will head out and search for adventure along the roads of California. Man-O-Man! It is the greatest thing to be an RVer. No sitting around for us. We are out there! 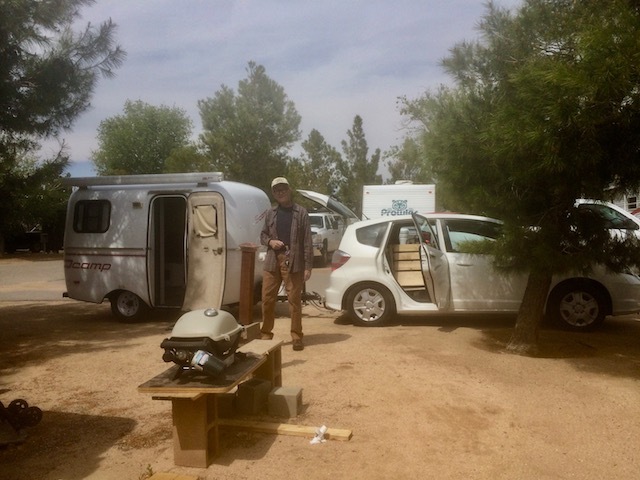 We were planning to Nite Camp around the Borrego Springs area. However, something happened to our iPhone when it was unplugged from power! Our iPhone screen went black. We could NOT restart it! I figured that our iPhone was a goner. And began to shop at a Best Buy in Santee, CA. But Best Buy did not have the one we wanted in stock anywhere in San Diego County. So, I decided to go to a nearby Cricket store. But when I parked near the Cricket store, I found a iPhone repair shop, and on a whim, went inside. The guy who waited on me pressed on the restart button and the home button at the same time [Soft restart]. And lo and behold, my iPhone came to life!! We had not planned on our adventure to be an iPhone adventure. But, we will take any adventure that comes our way! It's like being pretty much blind! 8:30am - We are sooooo excited this morning! Because this evening we get to see and listen to Pete's newly formed Rock N Roll Band! 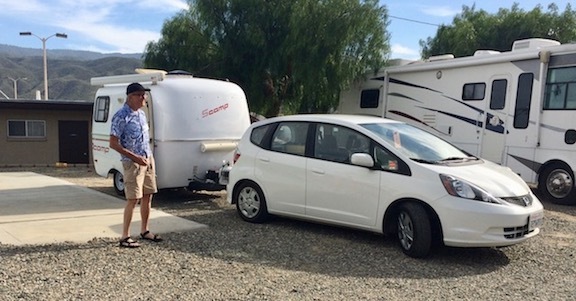 You may recall that we Blogged to you about traveling to Jojoba RV Park. Pete phoned and invited us here so we could attend his gig. That's why we are here. We checked the Specific Gravity [SG] of Scampy's battery. It was 1.235, indicating 75% charged. We want to be solar charging when the battery is 75%. So, our Renogy solar panels are now "on the job." By this afternoon, we expect to be at a 1.250 SG, which is 100% charged! 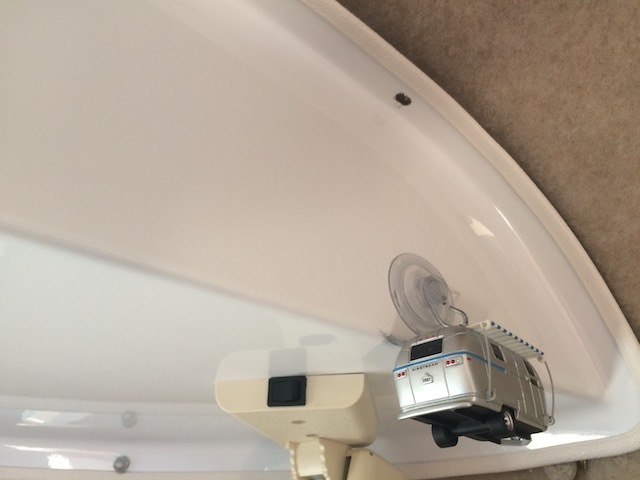 It is sooooo easy to use our Renogy solar! From the Jojoba library, I checked out, Jack Kerouac's "On the Road." Have you heard of Jack Kerouac? For me, this is a good read. But a sad story. Because Kerouac's drug of choice seems to be alcohol, and that's what killed him. At only age 47, in 1969, Kerouac died from internal bleeding due to long-term alcohol abuse. I do not wish to be judgmental of guys like Jack Kerouac. But I am! And I try very hard NOT to be. That's a weakness of mine that is very hard for me to overcome! I just cannot get my mind around highly talented persons who kill themselves by the use of drugs. Elvis Presley and Michael Jackson, for example [Link]. 7am - I've been buying discounted steak at Smart & Final with great success. Smart & Final discounts meat that is getting close to the "sell by" date. By 50% or more! tough! I was very disappointed! Not one piece of this top sirloin was tender! I am wondering what happened? Where did I go wrong? 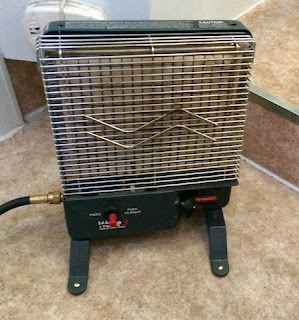 We use the Wave3 size catalytic heater to keep us warm when it is cold. Last nite our Wave3 set at low kept us comfortable. At Jojoba last nite, the low temperature was 52℉. When the temperature approaches 60℉, the Wave3 is not needed. At 50℉, the Wave3 at low does the job. At 40℉, the Wave3 at high keeps us comfortable. When MsTioga was still RVing, we had a Wave6. But found that this size was too hot, even on the low setting. PS: I've used Olympians since 2003. Members of Jojoba Hills RV Park must be capable and willing to contribute their talents and labor in maintaining the resort cooperative. For me, this requirement is a fantastic plus! When I was living in La Mesa at Guava Gardens Apartments, of course there was no such requirement. That meant that persons living at Guava did not have to "DO" anything. And often, not having to do anything resulted in withdrawal from associating with other tenants. Very easy in such an environment to live a somewhat boring existence with TV as their main companion. Yuk! 7am - This afternoon I've got another appointment at Kaiser. This time with a surgeon. There is a bump on my forehead. It's benign. 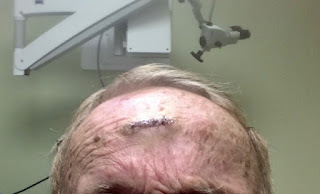 A hair follicle that did not grow correctly. Over time, this bump kept growing. Don't like it. I want the bump removed for esthetics. When looking at our archives and seeing where MsTioga went years ago, I want to go there too. My feeling is that Honda and Scampy could not manage the wilderness dirt roads that MsTioga managed with ease. MsTioga had lots of clearance. Honda and Scampy, not so much. It seems that Scampy would be wise to stay on paved roads. Nevertheless, Honda and Scampy have many wonderful places to go. Soon, I'm guessing, that we will head out to seek adventure along the paved roads of America! Anticipating difficult parking for Honda and Scampy, we arrived very early. Good thing too! 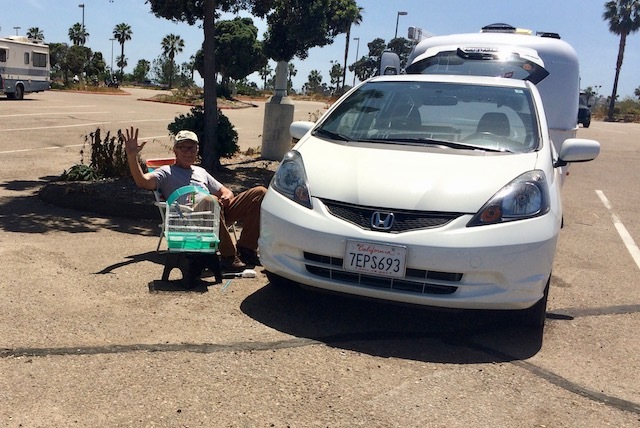 It took 45 minutes for security to locate us and then direct us to a place where both Scampy and Honda could park. The removal of the cyst went very well. No pain. It was sooooo easy for me! Below is an after pic. 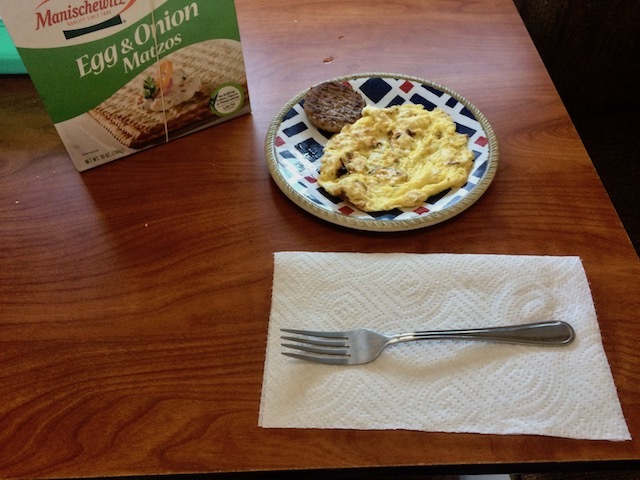 Sorry, it did not occur to me to take a before pic for comparison. When I was in my 18th year in 1956, I met Clara at a BBG social [Link]. That social was hosted by my sister at our home in City Terrace [East LA]. Soon we began going with each other. I often was invited to eat over at Clara's house. I met her father, Moises. And I learned about Moises' escape from the coming Holocaust. Moises got his family to Mexico in 1938. Mexico admitted only 1,850 Jewish refugees between 1933 and 1945. So, what Moises did was a miracle. Why am I writing about this long ago memory? Because the same thing is happening right now. All over the world. Jews are being threatened again. Especially the Jews of Israel. But this time, the Jews have their own country. And one of the best military in the entire world to protect them. Those that hate Jews, want to destroy them again, as the Nazis did. But are unable to do it. Try as they might. Lie as they might. There are only 16 million Jews worldwide. So few!! But we survive and flourish! 7:30am - One of the things that I enjoy doing is using my Blog's archives to see where I was on this date years ago. On April 23, 2005 I was visiting my son David. My son Joseph came over. I've been RV camping since 2003. It would be seem that by now, I would know all there is to know about street camping in cities and towns. 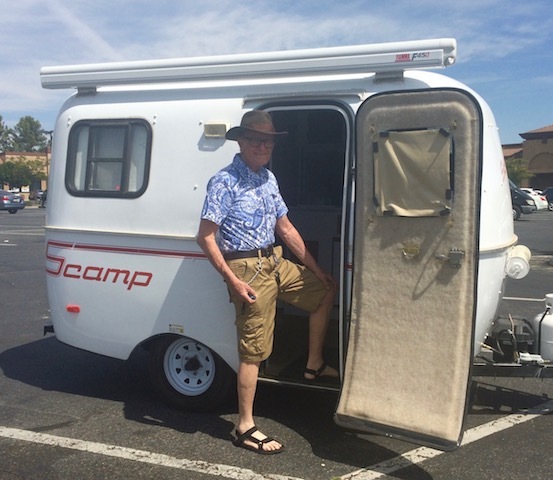 Just the other day, Scampy and I were cruising around the neighborhood of our Clairmont Mesa Nite Camp. We turned down a dead end street and came upon a large Class-A RV camped there. We became curious about this Class-A's Nite Camp because it was located on an incline. I never camp on an incline because it's not comfortable to sleep on an angle. 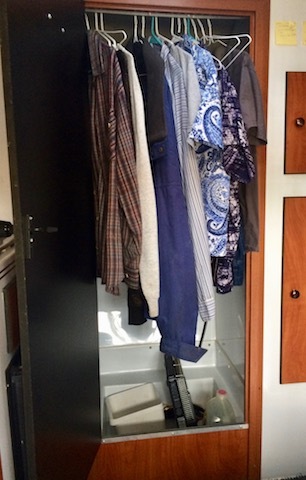 Also, it's not good for RV refrigerators. That's when it dawned on me that this was a dead end street. Hardly any traffic on a dead end street. So it's very quiet for sleeping here. Maybe that was the reason this Class-A was camped here. For the quiet! I've be Nite Camping on a dead end street ever since! Beach becomes extremely crowded. So, since today is Sunday, The Scampy RV Team headed over to the South Shore Boat Ramp. This place is huge! Very little of the lot is occupied. All of the parking area is reserved for vehicles with boat trailers attached. There are perhaps 150 such parking spaces here. I've been coming here for many years. And I've never seen more than maybe 15 boat trailers in this lot! 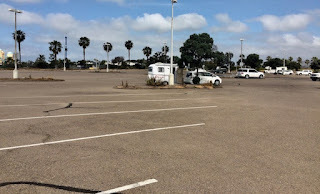 With all of this minimally used space, does the City of San Diego allow some of the Shore Shore lot for other vehicles? For example, RVs? NO they do not! 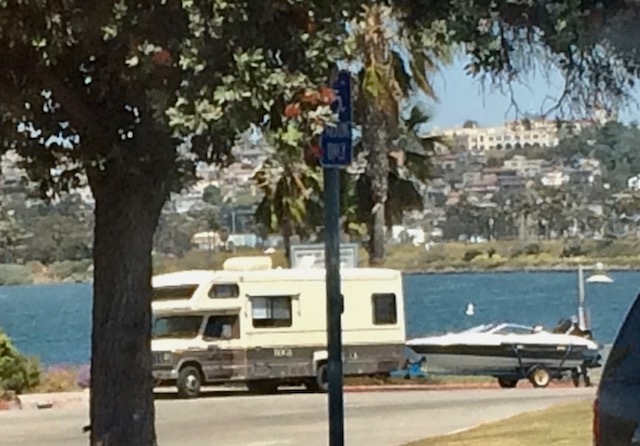 Because the City considers RVs to be a pariah. However, RVs come here anyway. Oh look! There's one in the pic below! I went out to do some cleaning maintenance on Little Honda. 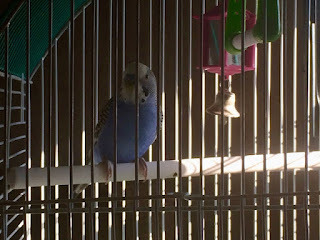 Boid got to tweeting very loud that he wanted to be out too! Boid told me, "I want to see the pigeons." 9am - Yesterday afternoon, we tested charging Scampy's battery with the Renogy solar panel while the battery charge controller was bypassed. The reason for the bypass was because our battery charge controller tapers the charging current MUCH too fast. The result was, after less than two hours, the battery's specific gravity went from 1.245 to 1.255! Since we began using the Renogy solar panels, when the battery charge controller was used, there was NO increase in specific gravity. Nothing! "George, Please be careful. If you have 12 V equipment in Scampy it could be damaged by 15 V. For example the fridge circuit board, led lights, phone charger, etc." We are sooooo happy to receive this warning. Because what Reader R. Wagner warned about never occurred to us! 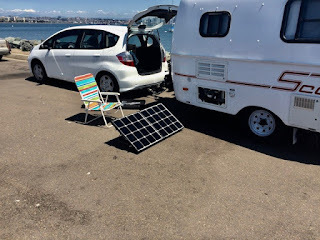 So, we disconnected Scampy's battery before connecting to the solar panel. While the battery is being charged, 12 DC will be provided from Honda's battery. Using Honda's battery during the day should not present any problem because we use only a tiny amount of electric power during the day. Only the Dometic fridge and charging power for our Mac computer are required. After using the Renogy Solar Panel in a suitcase for two days, it's become fairly easy for me to set it up and take down. So, I will continue to use the Renogy to charge Scampy's battery. You may recall that a couple of days ago we published "Renogy Alternatives" [Link]. We have returned to Mission Beach for the day. The parking lot near the Bahia Hotel is very large and has a lovely view of the Ventura Cove's water [Link]. Also, the high temperature here today is 73℉. Very nice! There is an RV Unfriendly sign posted here. We on the Scampy RV Team pay little mind to the nonsense of this sign. 12 noon - Specific Gravity UP! We just used our hydrometer to check the specific gravity of Scampy's battery. The specific gravity is 1.265 now! This reading is VERY good. But we are shooting for a 1.275 reading, which would be excellent! 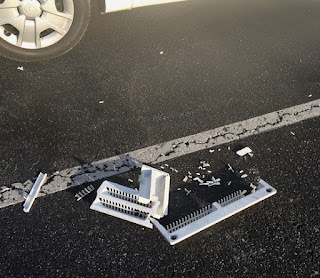 10:30am - We have stopped in the parking lot of an office building in order to publish this Blog post to you. Because it is Sunday, there are tons of people visiting PCH. We may have to be inventive to find a Day Camp with an ocean view! We have made a Day Camp [Here]. 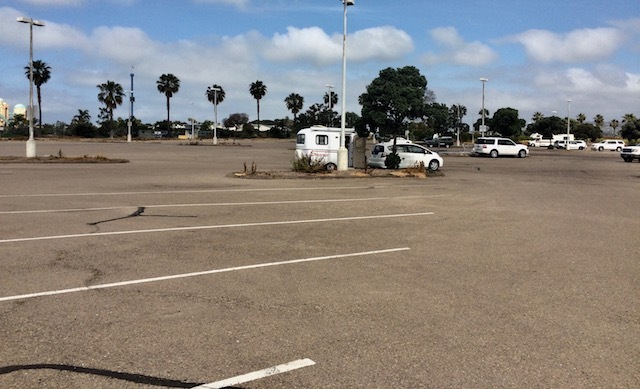 We would have to pay to park in order to view the ocean. We do not like paying money for what should be free! Scampy and The Team have made an Afternoon Camp at the South Shores Boat Ramp, next to Sea World. We had planned to remain near Evie's home until she received the Dometic fridge vent cover. But, I am guessing that we changed our mind. To the best of my recollection, we first made a Nite Camp up on Clairmont Mesa in 2005. 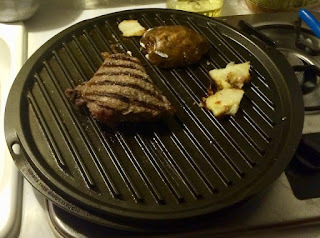 That was when Reader Phil treated me to supper at Outback Steak House. This evening, I see several RVs camped around here. Do you think that people found out about camping here because of us? 8:30am - Later this morning, The Scampy Team will be heading out. First thing to do, is go to the 24 Hour Fitness in nearby Temecula. Gotta keep those old muscles toned! We do not have to hurry to arrive at Cousin Jacky's home. The latke party begins tomorrow around 2pm. The replacement vent cover is on the way to my friend Evie's home. Hopefully the vent cover will arrive tomorrow. "24 Hour Fitness Super Sport"
The "Super Sport" Clubs are 24 Hour's best! They have all the amenities. The best and often the latest equipment. And lots of equipment too. Hot tub spa. Sauna. Steam room. Free towels. 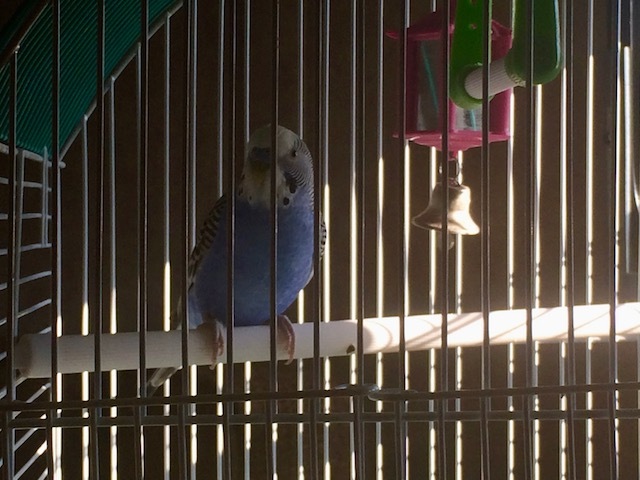 Evie recently moved to the Laguna Woods Senior Community. She has been living in her home there for about a month. When I was last here, she had just moved in. Since then, Evie has gotten her home in order. Very nice! She showed me all the pictures hanging on the wall. Of course, all of that looked very familiar to me. Many were the same pictures on the wall when Evie and I were still married. Our marriage ended in 1985. Thirty two years ago! We went out to supper together at King's Fish Restaurant. Great food! 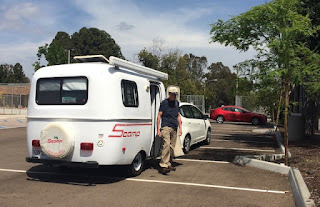 Scampy is staying in the parking area behind Evie's home. 8:30am - When outfitting Little Scampy, a gage was put on the propane tank's incoming line in order to know when the gas in the tank was getting low. However, the gage was not accurate. When the gage was warm, the gage showed more gas in the tank. When cold, the gage showed less gas. Often, when going to refill propane because the gage indicated low, the tank would only take 1/2 of the tank's capacity. So, the decision was made to remove the gage and let the tank go empty. We carry two backup propane tanks which are those tiny one pound tanks used on BBQs. So, we never run out of propane. Yesterday evening, our 20 pound tank went empty. When we connected a one pound propane tank, it appeared that this tank was empty! I was surprised! Astounded! When connecting the 2nd backup one pound tank, it also appeared to be empty! Now I was mystified and phoned my friend Pete Olson for help [Pete lives here in Jojoba Park]. Pete came over and brought with him three one pound tanks. All three of Pete's 1-Lb propane tanks appeared to be empty as well. Wow! Both Pete and I realized that something was wrong, but we did not know what. 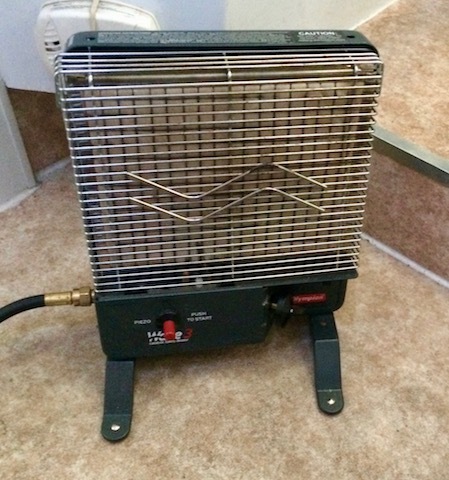 Pete suggested an electric heater, and he brought one over. I went online and searched for what could cause this problem. I came up with a possible answer. When a propane tank goes empty, air may enter the incoming line. When a full propane tank is then connected, the propane mixes with that air. The result is when attempting to lite up a stove's burner, the flame either will not lite up or it will lite, then go out. The incoming propane line needs to be purged of air. If the stove's burner is lit up repeatedly, eventually the incoming line gets purged of air. After going over the hassle of using backup one pound propane tanks, I decided to return to using a propane tank gauge! 7:30am - We are using a more adaptable way to make Nite Camps. This new way uses time of day as the main feature. Before, we used to cruise around searching for a Nite Camp where we would not be spotted by local residents who might report us. Now, we locate our Nite Camp site inside a residential neighborhood. We do this locating during the day. When it is 11pm, we return to that previously picked Nite Camp site. Our iPhone alarm is set to 6am. Then we go to sleep. This method works because local residents are unlikely to see Scampy between 11pm and 6am. In the past, we have been criticized for violating government regulations concerning sleeping in a vehicle. When we first began RVing in 2003, good Nite Camps were numerous. 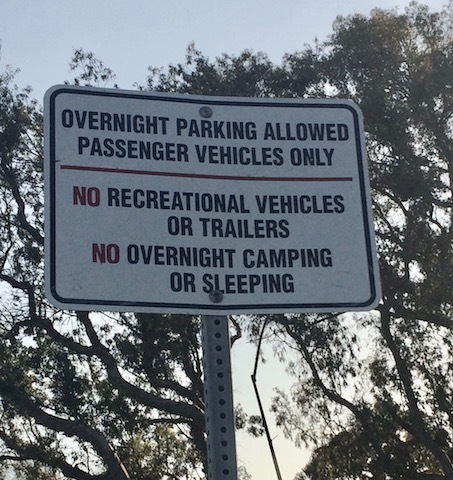 As the years rolled on, government issued regulations to prevent RVers from Nite Camping on the street. We on the Scampy Team, do not like being put in a position of being law breakers. However, government in our opinion, is in many cases, arbitrary. Unrestrained and autocratic in the use of their authority. The Scampy RV Team has just arrived at our future home. Jojoba Hills SKP Resort. We are staying here for two days. Leaving on Friday, April 14th. 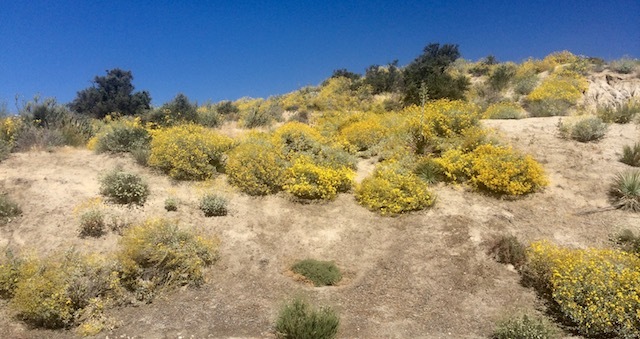 During the trip here, while driving thru Temecula Valley, we were sooooo happy to see how the rain has changed the flowers. There are so many flowers now! We are going in a southerly direction. Lots of desert. 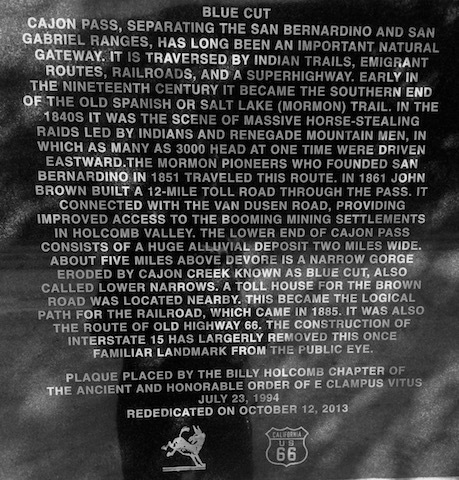 We came to a sign which announced: "Historic Route 66 next right." So, we went right! We came to a place where a bunch of oak trees created a shady place for Morning Camp. 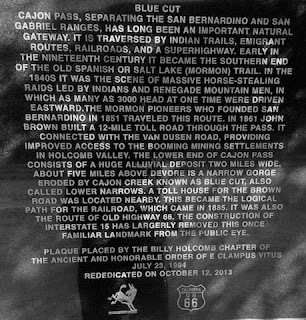 A stone marker described this area. We did not realize until we just checked that our trip beginning in Palmdale today was 115 miles distance. Honda & Scampy get 22 miles per gallon. So the fuel for this trip cost $15. The late MsTioga got 7 MPG and this trip for her would have cost $47! I don't get sleepy driving anymore. That's probably due to sleeping 7-8 hours each day 😎. It seems to me that my overall health has improved since my sleeping habits got sooooo much better! 6pm - Fridge vent cover destroyed! Our Dometic fridge's flame goes out whenever Scampy is moving. This is a defect which appears to have no good resolution. So, I have to remove the vent cover and restart the flame every time Scampy parks. I am guessing that when I restarted the flame this time, I forgot to reinstall the vent, and just drove away. Somebody drove over the vent when it was left lying in the parking lot. On May 15th, 2004, MsTioga and I made a Camp on the Salmon River in the State of Idaho. We were kind of newbies back then. However, I believe that we were courageous! We just traveled, not worrying much about where our Nite Camp would be. 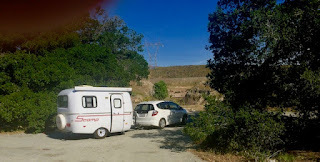 We found after almost a year of RVing, that we always found a Nite Camp. So, why spoil a day's journey by worrying? Please click [Here] to read about that long-ago day. 12 noon - We just got back from 24 Hour Fitness and grocery shopping at the Food For Less market. This morning we arrived at 24 Hour around 8 am. Pretty early for us. Some days arriving early at 24 Hour will find the club very busy because of aerobic classes. There is no aerobic class on Friday. So, it is relatively quiet here at 24 this morning. I just finished viewing the movie "Se7en." This movie is #22 on the Top 250 list of the Internet Movie Data Base [Link]. Everything is terrific about this movie. Actors: Morgan Freeman, Brad Pitt, Gwyneth Paltrow. Directing, first rate. But the plot is sooooo sick. Terrible beyond belief. Torture. Murder. Madness. I am beside myself wondering what kind of person would write such a screen play? As the movie came to its end, I was not left with enjoyment. I was left wishing that I had not viewed it! One year to good health! Do you recall when my right arm and leg began to twitch? I was in Guatemala when that twitching began. At that time, I was taking a bunch of prescription meds for blood pressure, blood thinners, etc. My weight was 185 lbs. Since that time, I went off ALL prescriptions meds. My weight is now 150 lbs. My Body Mass Index is 21.5, normal. My right and leg no longer twitch. Right after this Blog post is online, I'm heading up to Apple Valley's library. One of my favorite places around here. They have a fast WiFi there. Love that! During browsing in recent weeks, I've been hit several times with a request to update my Adobe Flash Player. I never updated, because I suspected the request was not legitimate. However, this evening a "Fake" Adobe Flash Player update link arrived in front of a movie that I wanted to view online. Very Clever!! Foolishly, I clicked on the update link. As soon as I clicked, a tiny window opened that could not be closed, requiring me to click on that window to proceed. If this happens to you, force quit your computer. Don't click on anything! I had to do research in order to remove the malware. I finally got rid of this thing by removing Adobe Flash Player from my mac and resetting my Chrome browser to default. Also, I had to remove several malware applications that got installed. Took over an hour to do all of this. Very ugly! But Chrome is running very well now. PS: I am not using anything from Adobe anymore! I deleted Adobe Flashplayer and replaced it with SupremePlayerLite from the App Store. During the 70s I worked out at a gym with two exercise partners. We used dumbbells and barbells. And we used the heaviest weights that we could handle in order to build muscles. Now I am in 80th year. My exercise routine has adapted to my age. My goals now are to keep my body in shape. Not build muscles. Treadmill for cardio. Machines for muscles. At my 24 Hour Fitness Club, there are maybe 100 cardio machines. On the treadmill, I walk at about 2.2 miles per hour for 30 minutes. At a 4 degree rise. In the weight machine area, my routine is to use a resistance that I can handle easily. For as many repetitions as I am able. When the muscles that I am using get tired, I move on to another machine. I'm going to 24 Hour Fitness every other day. I'll be there today. Working out is addictive. I've just returned from working out. Decided to go in the evening. Arrived there about 9:30pm. The club is much quieter and relaxed after 9pm. Also, traffic returning home is very light. I like that! While doing some research about Lewis and Clark this morning, I came upon an image of a very large denomination gold backed bill. This bill fascinates me. Because it is not what we have now as money. Our present bills are Federal Reserve notes, which are not backed by anything. It is Fiat Currency whose value is solely based on faith of people of its worth. Note: President Woodrow Wilson is the face on this bill. 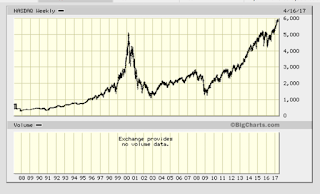 My Blog began in May, 2003. That was only a few months after Google purchased Blogger from its creators. At that time, a blog was a list of posts in reverse chronological order. Newest post at the top. There was no easy way for you to look at one of my Blog posts from years ago without scrolling down a huge list of Blog posts searching for the one you wanted. That's when I created my "Calendar Archives" which allowed readers to go to any particular date directly. Have used my Blog's archives [Link] to look at past posts? You may have noticed some strange buttons that read "Yesterday" and "Tomorrow." I wanted my readers to be able to go from post to post, day by day [like it is now]. In order to do that, I created my own layout by writing the HTML code Blog template myself. Every day, I manually inserted "Yesterday" and "Tomorrow" links in the HTML code of my post. Years later, Blogger made it impossible to use my HTML code for a template. 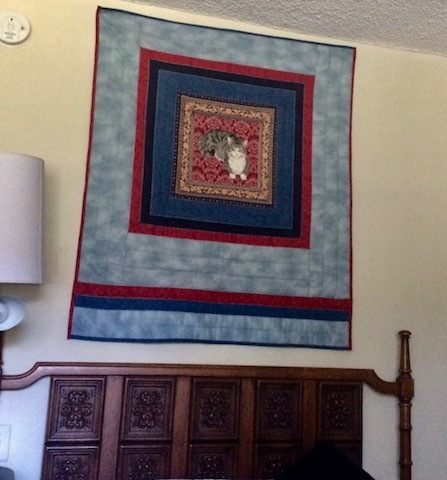 So, I converted my Blog to what came to be known as a "Layout." But since my old "Yesterday" and "Tomorrow" links were part of each Blog post, those links remained. These links are not in the proper location now, because of the conversion to Blogger's layout. PS: This explanation may be hard to comprehend. But it's on my mind, so I made this Post/Explanation.